When Mark Zuckerberg took to the stage today at MWC 2016 for the Facebook keynote, he talked again mostly of his excitement for VR. He also discussed the future of 5G, Free Basics and a growing focus on sharing video. But the Facebook CEO also had some choice words regarding artificial intelligence (AI), revealing perhaps why we shouldn't worry about AI just yet. He said that, while AI is becoming increasingly important in a lot of different fields of life and study, "we're nowhere near understanding how intelligence actually works." Instead, most AI programming being used today is based on pattern recognition, such as facial or voice recognition. This level of AI isn't what Elon Musk and Stephen Hawkings warn us against, which is more a concern over the potential militarization of AI. However, Zuckerberg explains the AI technology being used in autonomous cars, for example, uses pattern recognition to stay in a lane. Meanwhile, in the medical field, AI programming is becoming powerful enough to accurately diagnose skin cancer. Zuckerberg himself is currently building his own personal, Iron Man-style artificial intelligence. "I just want to control my house," he explained very simply of the project, which he described earlier this year as a personal effort that would help him run his home and help him with his work. While he plans on eventually sharing his Jarvis-like program with the world, it isn't clear whether this Jarvis-type program will eventually become "M", which Facebook introduced last year as a personal assistant that lives inside of Facebook Messenger. 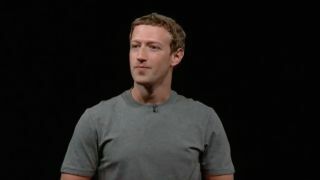 Either way, you shouldn't expect to see the fruits of Zuck's labor anytime soon, with the young CEO saying in his address that it "takes a lot longer than people think" to build an AI program.